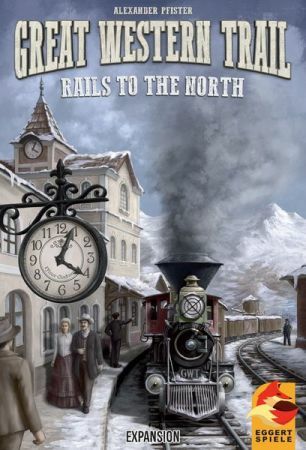 A review of the expansion Great Western Trail: Rails to the North by Alexander Pfister. Any good? Read on.. The set up remains the same, with a couple of extra steps; You add the extention board, which fits onto the old board nicely, thanks to a folding mechanic. NOTE: It has been reported that the fitting in an issue on some editions, but it's easily fixed. On this board you add 6 of the 10 medium town tiles to the town spaces. Return the remaining 4 to the box. You add the expansions 6 new station master tiles to the base game's, shuffle them, and put 5 of them on the original spaces, and 2 of them on the new spaces. The remaining 4 goes right next to city of New York. Every player get an "Auxiliary add-on" to their private board, place their additional disc on the correct space, and add the 15 branchlets, which are used to populate the towns with houses. another town square that has one of your branchlets. Placing branchlets either costs you money, gets you money, or gives you an immediate action, and depening on the size of the town, may give you the ability to upgrade the station in the town etc. Placing branchlets on a medium town also triggers the effects on the medium town tile, for an example moving your train 3 spaces forward. Clearing the spaces where the branclets are on you private board also gives you access to to the bell spaces, which gives you more actions and potentially more points at the end of the game. There is also some new abilites on the cities when delivering cattle to them, adding even more variety. Adds more mechanics to a game already packed with them, in a smooth way. Adds alternatives to Kansas the first two rounds. New stuff to a game already packed with things to do might not be ideal for new players. Adds a tiny bit up set up time. Like stated above this expansion really adds alot more variety, mechanics and general awesomeness to an already awesome game. If you are a fan of the base game, this one is a no-brainer as far as we're concerned, a great expansion for GWT.